Zoe Horne is a chef and food writer turned small business owner, she uses her extensive experience in the food industry and fresh local ingredients to bake irresistible cookies and brownies. 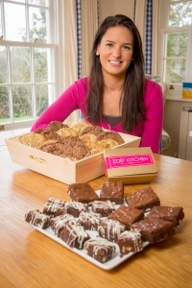 Here she tells us a little more about her business, Zoe’s Kitchen. I’ve been baking all my life. I grew up within the food industry, my parents ran a food manufacturing business, supplying mayonnaises and salad dressings to major supermarkets, with brands including Pizza Express and Mary Berry. Following in their footsteps I trained as a chef at Leiths School of Food & Wine, London, baking was my favourite part of the course. After obtaining my diploma I landed my ideal job cooking and writing for the food pages at Good Housekeeping Magazine, where I stayed for 3 years before moving to Jersey. Upon arriving in the island, I freelanced as a food writer. However I missed being constantly hands on with food so I felt the need to start my own business, drawing on my extensive knowledge in the food industry and advice from my parents experience. Its quite ironic how I have started out just as they did, exhibiting at local markets and fairs. A typical work day starts with attending to emails and orders first thing, confirming delivery or collections times and dates with clients. Writing a list of ingredients and hoping I have enough, if not then popping to the shops! 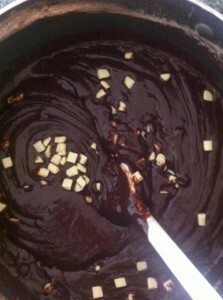 Then baking for however many orders I may have. Whilst baked goods are cooling, I collate the packaging I need and have them ready to bundle up! Not forgetting a little update on Facebook perhaps with a picture sharing what’s going on in the kitchen that day! My most popular items are Chocolate Brownie Bites and The Chocolate Package (3 cookies and a box of bites, a sampling of both!). The Ultimate Package (A little of everything!) has proved a hit in the offices and for birthday parties! 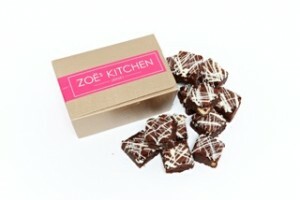 Zoe’s delicious cookies and brownies are available online at www.zoes-kitchen.com, you can order and pay online and Zoe can even deliver island wide. 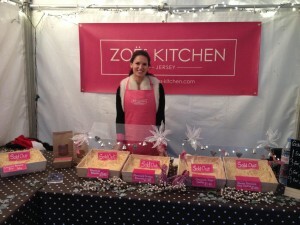 Look out for Zoe’s Kitchen at the markets in St Aubins and Royal Square from May. As well as The Boat Show, 6th-8th May, and Food Festival launch on May 18th. 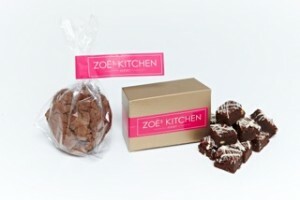 Don’t forget to “Like” Zoe’s Kitchen on Facebook for the latest news and mouth-watering photos of cookies and brownies fresh from the oven!